Around a hundred films have been made in different languages on Gurudev Rabindranath Tagore’s literary work. The sad part is that a lot of films are either lost or their prints are in a rundown state; in addition there is low awareness around these cinematic gems amongst the movie-goers today. Thankfully, NFDC (National Film Development Corporation) is working towards the restoration of these films. On the occasion of Tagore’s 150th birth anniversary, NFDC in association with the Government of India has launched a collectors’ edition, DVD box set of films based on his work. The audio-video is digitally restored and the six DVDs are packed in an attractive box set with an informative booklet on Gurudev’s work. Priced at only Rs. 399, it is available at all leading music/video stores and online stores such as Flipkart (which also has a discount). The pack contains five movies and two documentaries made by filmmakers like Satyajit Ray, Tapan Shah, Hemen Gupta and Kumar Shahani. The films are in Bengali or Hindi and come with English subtitles. I confess that I was equally ignorant of these treasures but now I am a proud owner of this commemorative set; and plan to watch a lot more movies based on Tagore’s stories and the filmmakers featured. Released in 1961, this Bengali film has three of Tagore’s stories presented as three different short films in one. Interestingly, Ray made this film as a tribute to mark Tagore’s birth centenary. In all three stories, female characters are in focus and the director beautifully portrays their emotions on-screen. The first story, The Post Master, is about a young orphan girl of about 8-10 years, Ratan (Chandana Banerjee), who works as a maid in the village postmaster’s house. Her new master is a young man from Calcutta, Nandalal (Anil Chatterjee) who misses the hustle-bustle of city life and his family back home. Unlike her previous masters, Nandalal is kind to Ratan and starts teaching her Bengali so that she can read and write like his own sister in Calcutta. The film has very few dialogues and silence works well for the simple narrative. The final sequence is heart-breaking and enhances the beauty of this simple story. Monihara (The Lost Jewels) is the second story in the film and is a psychological thriller. Manimalika (Kanika Majumdar) is married to a rich man Phanibhusan (Kali Banerjee) and stays in a large mansion in a village. Bored at home, her only companions are her pieces of jewelry. She loves her jewels more than anything and her obsession with them becomes visible when her husband faces financial crisis. This part of the film reminded me of Alfred Hitchcock’s Psycho and Rebecca with the narrative style and the whole set up, including stuffed birds! Samapti (The Conclusion), the third piece in the film is a love story. Mrinmoyee (Aparna Dasgupta) is a carefree young girl, who as per her mother does nothing what good girls of marriageable age should do. She spends her time playing with kids, chasing squirrels and enjoying the swing next to the river. 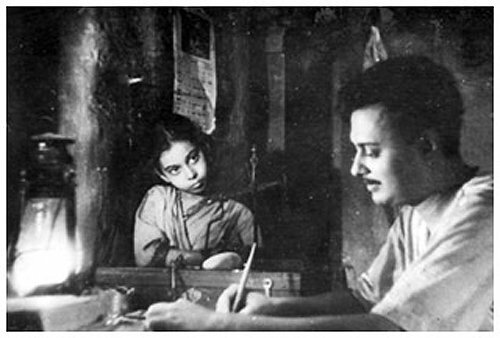 She catches the attention of Amulya (Soumitra Chatterjee), a young man who is returning to his village after taking his exams in Calcutta. His mother has already found a suitable match for him but he convinces her to arrange an alliance with Mrinmoyee. The film captures the innocence of a young married couple who are different from each other and one of them does not even understand the meaning of marriage or love. Teen Kanya presents three different films in one and all are masterpieces in their own genre. My favourite is The Postmaster followed by Samapti and then Monihara. Other films in the set include Khudito Pashan aka Hungry Stones (1960, Bengali) directed by Tapan Sinha; Kabuliwala (1961, Hindi) directed by Hemen Gupta; Ghare Baire aka Home and the World (1984, Bengali) directed by Satyajit Ray and Char Adhyay aka Four Chapters (1997, Hindi) directed by Kumar Shahani. There are two documentaries in the set also including Natir Puja (1932, Silent) directed by Tagore himself and Rabindranath Tagore (1961, English), a dramatized documentary on Gurudev’s life, directed by Ray again. Click here to read more about all these films and get hold of your own set soon.